Meet your health and nutrition goals with healthy diabetes meal plans, shopping strategies and our handy portion control guide. Two great tools for healthy eating – Diabetes Meal Planning Made Easy and the Healthy Portions Meal Measure! Meal planning is one of the hardest parts of managing diabetes. The new edition of Hope Warshaw’s best-selling book gives you all the tools you need to plan and eat healthier meals. 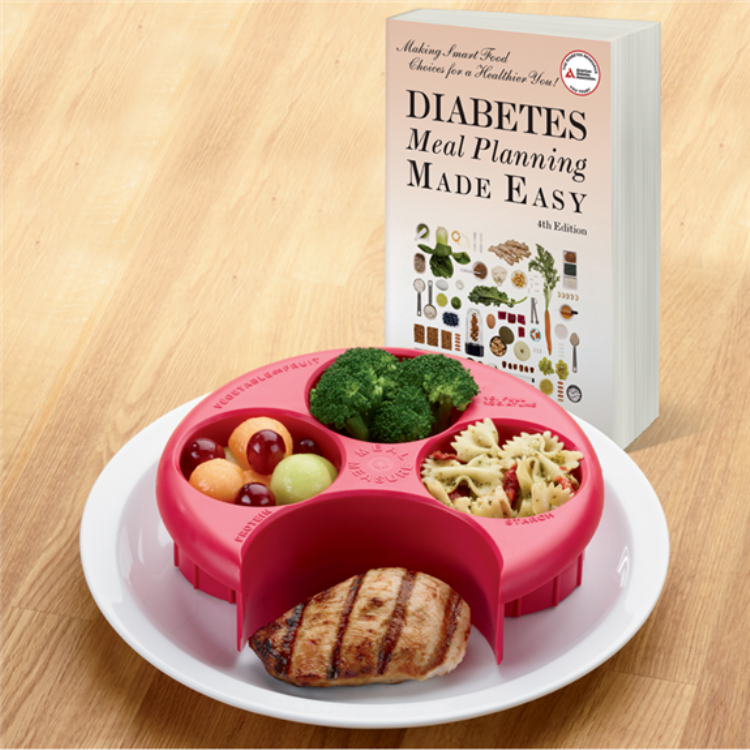 Updated to include the latest nutrition recommendations for the American Diabetes Association® and the federal government's Dietary Guidelines for Americans, Diabetes Meal Planning Made Easy is a resource no person with diabetes should be without. The Healthy Portions Meal Measure is a plastic portion control guide that fits right over your plate. Serve yourself or others just the right amount at every meal. Now you can measure your protein, starch, vegetables and fruit for perfect portions. Each cavity of the meal measurer has a 1-cup and1/2-cup mark so you can adjust portions for your individual dietary needs. Portion control is an important part of weight management, and this handy plate guide makes it easier than ever. Clean up is simple—the healthy portion meal measure is completely dishwasher safe. 8”diameter. I am an RN who cares for patients with traumatic brain injuries, some of whom are also diabetic. I plan to use this device to teach the patients and their caregivers an easy way to appropriately portion meals and guide them to select appropriate foods. This device will make it fun for the patients to participate in their meal planning too.